Note: Motobu Naoki Sensei of the Motobu-ryū was so kind to share the articles by Murakami Katsumi and from “Gekkan Karatedo” used in here with me. He also was so kind to help with the translations. Thank you very much Motobu Naoki Sensei! Recently, I published the translation of an article by Murakami Katsumi from 1991. In it, Murakami Sensei wrote about his teacher Shimabukuro Tarō, who learned Rōhai, Wansū and Wankan from Iha Kōtatsu from Tomari. Let me introduce Iha-gwā no Nushi from Tomari. Iha-gwā was the teacher of Shimabukuro Tarō AKA “Aburaya Sanjin” (nickname). Shimabukuro Sensei talked about Iha-gwā as follows. Iha-gwā no Nushi here refers to Iha Kōtatsu. Rōhai in Murakami 1976: 133–142. In other words: This is one very credible source for the Kata Rōhai, Wankan, and Wansū as having been handed down by Iha Kōtatsu and probably earlier masters of what is referred to today as Tomari-te. BTW, I personally studied these three Kata Wankan, Rōhai, and Wanshū at that same place called the Matsubayashi-ryū Karate-dō Kōdōkan Dōjō in Naha Kumoji. I also performed all of them during gradings at that same place and did not fail. So you can assume I know them a little. That means, with Murakami Katsumi and Nagamine Shōshin, there are two independent sources of the same Kata from the same lineage, i.e. Iha Kōtatsu. Rōhai in Nagamine 1975: 248–255. Plus, if you trust my judgment, I learned them personally from one of these lineages. Well, there is also an alternative lineage that claims the inheritance of Kata from Iha Kōtatsu. The problem is: This alternative lineage claims the direct inheritance of the three Kata in question from Iha Kōtatsu. At the same time, both their Wankan and Rōhai are just completely different Kata. How can that be? Maybe they did not carefully read the books by Nagamine and Murakami. 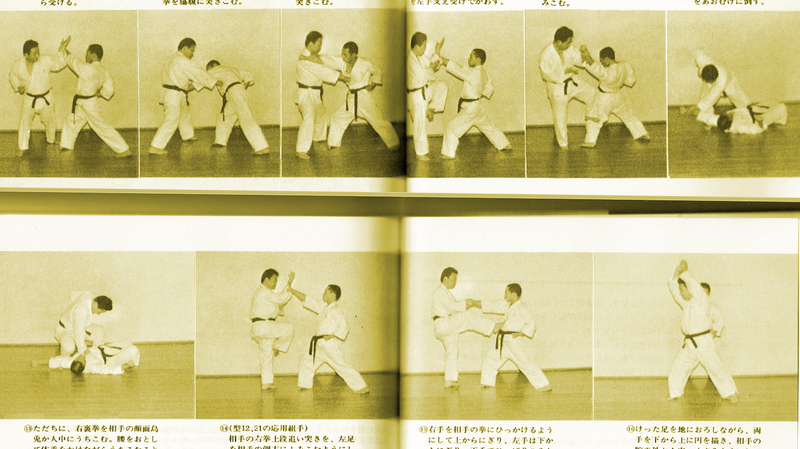 In the end that alternative club was established only 6 or 7 years respectively after the books with the Kata shown in pictures were published. A representative Kata of Tomari-te, it is a brilliant Kata that is nimble, fast as lightning, profound and rich in variety. It is the type of Kata that you want to do many times. It is a Kata that is very useful for actual combat. When applying the movements 12/21, it is most important that the opponent is controlled by uke-sabaki [similar to irimi]. This part is a technique essentially seen in the defenses of the Chinese Kempō of Baguazhang and Taijiquan. In addition, it must be carried out similar to Irimi-nage of Jūjutsu and Aiki. In Okinawa, there was a person named Motobu Chōyū (AKA Motobu Umē), who was the older brother of Motobu Chōki. My former teacher Kyoda Jūhatsu Sensei, Miyagi Chōjun Sensei, Mabuni Kenwa Sensei, Shiroma Kōki, and Go Kenki Sensei studied with him at the Karate Club in Wakasa Town, Naha. In addition to being the manager of this Karate Club, Motobu [Chōyū] Sensei very much liked playing the Sanshin and he seems to have been very good at it. Currently there is a Karate teacher called Uehara Seikichi, who was a disciple of this Motobu Umē [Chōyū]. The technique (Te) that this Uehara Seikichi uses, currently in Okinawa is called Koden Bujutsu Motobu-ryū Torite. This Torite means entering the opponent’s attack at the moment he comes in (and then control and throw him). It seems that what is the most basic of Torite’s entering techniques is substantially the same as Wankan’s technique 12/21. In case of being thrown by technique 12/21, the person thrown does not understand how he got thrown. It is a technique that you want to make a skill of the deepest level (gokui-waza). I was told by an authoritative person that some of the applications used by Murakami Sensei are similar to Motobu Udundī, others are similar to Motobu Kenpō. The reason for this might be that Kyoda Jūhatsu and Shimabukuro Tarō were among Murakami Katsumi’s teachers: Kyoda trained Torite with Motobu Chōyū and Shimabukuro Tarō trained Kumite with Motobu Chōki. Therefore, both influences exist in Murakami Sensei’s application of the Kata. Wankan application by Murakami Katsumi (1976). Takamiyagi Shigeru et.al. : Okinawa Karate Kobudō Jiten, 2008. Murakami Katsumi: Karatedō to Ryūkyū Kobudō. Seibidō Shuppan, Tōkyō 1976. Murakami Katsumi: Kata no Kokoro to Waza. Shin Jinbutsu Ōraisha, Tōkyō 1991. Nagamine Shōshin: Shijitsu to Kuden ni yoru Okinawa no Karate, Sumō Meijin-den. Tōkyō, Shin Jinbutsu Ōraisha 1986. Nagamine Shōshin: Okinawa no Karate-dō – Rekishi to Densetsu o Mamoru. Tōkyō, Shin Jinbutsu Ōraisha 1975. This entry was posted in Unknown Ryukyu and tagged Iha Kotatsu, Murakami Katsumi, Nagamine Shoshin, Rohai, Shimabukuro Taro, Wankan, Wanshu, Wansu. Bookmark the permalink.